Son of Shri P. Ranga Rao, Shri P.V. 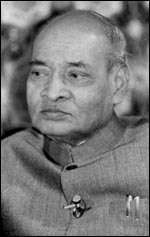 Narasimha Rao was born on June 28, 1921 at Karimnagar. He studied in Osmania University, Hyderabad, Bombay University and the Nagpur University. A widower, Shri P.V. Narasimha Rao is the father of three sons and five daughters. Being an agriculturist and an advocate, he joined politics and held some important portfolios. He was the Minister of Law and Information, 1962-64; Law and Endowments, 1964-67; Health and Medicine, 1967 and Education, 1968-71, Government of Andhra Pradesh. He was the Chief Minister, Andhra Pradesh, 1971-73; General Secretary, All India Congress Committee, 1975-76; Chairman, Telugu Academy, Andhra Pradesh, 1968-74; Vice-President, Dakshin Bharat Hindi Prachar Sabha, Madras, from 1972. He was also Member, Andhra Pradesh Legislative Assembly, 1957-77; Member, Lok Sabha 1977-84 and was elected to Eighth Lok Sabha from Ramtek in December, 1984. As Chairman, Public Accounts Committee, 1978-79 he participated in a Conference on South Asia convened by the School of Asian and African Studies, London University. Shri Rao also Chaired Bhartiya Vidya Bhavan's Andhra Centre; he was Minister for External Affairs from January 14, 1980 to July 18, 1984; Minister of Home Affairs from July 19, 1984 to December 31, 1984 and the Minister of Defence from December 31, 1984 to September 25, 1985. He then assumed charge as Minister of Human Resource Development on September 25, 1985 .